Though it's one of the older cars in the midsize segment, the 2007 Honda Accord is still a great choice for consumers wanting a sedan or coupe that does just about everything right. Other than the introduction of a new Special Edition V6 trim level, there are no changes for the 2007 Honda Accord. Roomy and stylish interior with simple controls, tight build quality, smooth ride, refined drivetrains, good crash test scores, strong reputation for reliability, high resale value. For much of the past two decades, the Honda Accord has been one of the most popular vehicle choices for American families. Why? No matter what year of Accord you examine, you can assume with fair confidence that it's safe, comfortable, fuel-efficient, decently powerful and above average in terms of reliability and resale value. Other cars have eclipsed the Accord in some of these areas at certain points of time. But only a rare few have been able to match the Honda in all of them. The Accord has simply been one of the best cars sold in America, period. The trend continues with the 2007 Honda Accord. It's available as a coupe or sedan with either four-cylinder or V6 power. In a simple fashion, Honda gives each trim a select number of standard features. The range starts with the budget-oriented Value Package trim and tops out with the luxurious EX-L. The Accord Hybrid is available for 2007 as well. The Hybrid features the company's third-generation IMA electric assist system matched with a gasoline V6 power plant, making it the most powerful and elite Accord in the lineup. Shoppers interested in a midsize sedan or coupe for 2007 should be aware that the current Honda Accord is one of the older choices currently available. Its last full redesign was for the 2003 model year. Make no mistake: Like Nolan Ryan playing for the Texas Rangers, the Accord still has the goods to back up its legendary name. But the Accord is starting to show its age in a few areas. Some of its features and design elements are starting to seem rather ordinary, and the Hybrid's real-world fuel economy is disappointing. While we still wholeheartedly recommend the Accord, take a look at the new Toyota Camry or Volkswagen Passat before you make a final decision. 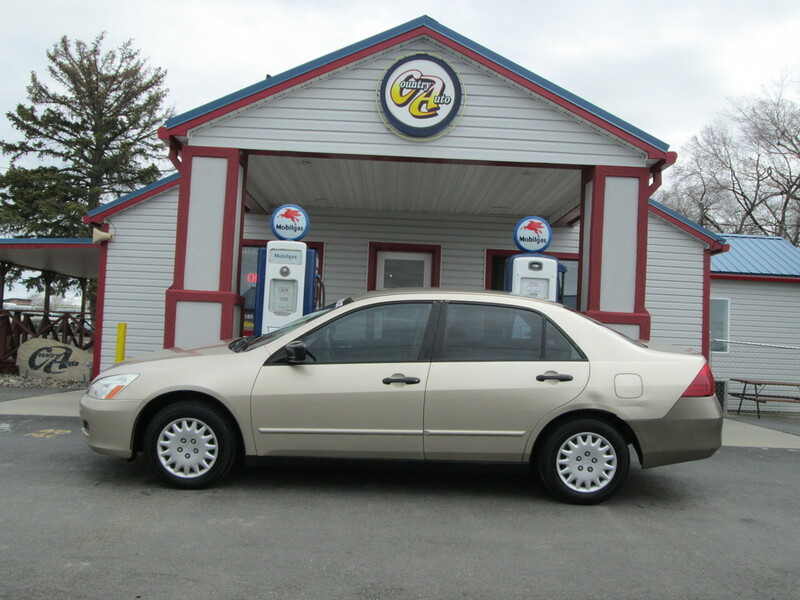 The 2007 Honda Accord is available as a midsize sedan or coupe. There are two main trim levels, LX and EX, and their supporting subsets, LX V6, EX-L and EX-L V6. Honda also offers two additional trim levels for the sedan: Value Package and SE (Special Edition). The entry-level Accord Value Package sedan provides air-conditioning, power windows and locks, a CD stereo, keyless entry and cruise control. To this the LX trim adds power mirrors, an upgraded audio system and a few extra interior features. The SE is similar to the LX but has 16-inch alloy wheels (17s for V6-equipped SE models), rear disc brakes, a six-disc in-dash CD changer and steering wheel-mounted audio controls. V6-equipped LX models have 17-inch alloy wheels, heated mirrors, a moonroof and a power driver seat. The four-cylinder EX is equipped much like the LX but with a few extra features; going with the EX-L provides leather upholstery, heated front seats, satellite radio, dual-zone automatic climate control and an optional navigation system. The V6-powered version of the EX-L and the Hybrid top the range by having all of the Accord's available features (except navigation) as standard, as well as a power passenger seat and a HomeLink transmitter. There are two main engines available for the front-wheel-drive Honda Accord. Regular models have a 2.4-liter four-cylinder engine capable of 166 horsepower and 160 pound-feet of torque. It's connected to either a five-speed manual transmission or a five-speed automatic. The larger 3.0-liter V6 puts out 244 hp and 211 lb-ft of torque. SE and LX models with this engine have a five-speed automatic as standard. The EX-L V6 is eligible for a six-speed manual transmission as well. The Accord Hybrid features the company's third-generation IMA electric assist system matched with a modified version of the V6 that has cylinder deactivation technology. With 253 hp and 232 lb-ft of torque, it's the most powerful Accord in the lineup. The hybrid system can capture electrical energy during braking or deceleration and store in in the vehicle's special battery pack.. In addition, the system features the ability to shut off the engine during vehicle stops for further efficiency gains. Fuel economy, at 28 mpg city/35 mpg highway, is similar to the four-cylinder model's. All Honda Accords come with antilock brakes, front seat-mounted side airbags and full-length side curtain airbags as standard equipment. Stability control is standard only on V6 models. In NHTSA (government) crash testing, the 2007 Honda Accord received a perfect five stars for frontal-impact protection. Four stars were awarded for protection of front occupants in side impacts; side-impact protection for rear occupants rates five stars for the coupe and four stars for the sedan. In IIHS testing, the Honda Accord earned a "Good" rating (the best possible) for frontal-offset and side-impact crash safety. Inside, the Honda Accord is furnished with attractive, high-quality materials assembled to exacting standards. The stylish cockpit is almost flawless when it comes to ergonomics, and the seats are carefully designed to provide an agreeable compromise of cushioning and support. In back, the Honda Accord provides one of the roomiest backseats for its segment, and the seat design is such that just about any child's car seat can be installed with minimal hassle. Large cupholders, thoughtfully designed storage areas and a 14-cubic-foot trunk in the sedan (11.2 for the Hybrid) round out the Accord's family-friendly package. The Accord's steering has a slick, precise feel and the suspension provides a comfortable ride as well as a composed attitude while cornering, though sharper-handling cars like the Ford Fusion or Nissan Altima are more entertaining to drive. Both engines, in typical Honda fashion, are smooth and powerful. Our main gripe about the Accord concerns its brakes; brake pedal feel is reassuring, but stopping distances are longer than those of competing cars.